Onam is one of important festival of Kerala, my home state. Just like Thanks Giving dinner is must for Thanks Giving, Onasadhya (feast) is the main attraction for Onam. The houses are colorfully decorated with flowers and the people take part in various festivity activities. Kids use this time off from to play mainly cricket. When we were young swings would be put up from tree branches and he would enjoy swinging. Nowadays people would go to the new movies release during the time of Onam after the feast. Every major actor in Kerala makes sure that he will have an onam movie. Shops will be crowded with selling new clothes, vegetables, and gold, even you can buy banana chips and other side dishes. Previously all the dishes used to make at home now some of them are available from shops. There will onam fairs, shows and parade on the 10th day of celebrations. Onam celebrated mainly on second day we call it Thriuonam or Randam onam, this year it falls on 9th September 2011. During the day according to folk tale, king Mahabali who ruled us several years ago comes to visit us. In order to please him also and to show him that we are doing fine, we make grand feast on the day. Normally Onam sadya consists of around 20 different dishes such rice, parippu curry ( lentil preparation), ghee (clarified butter), sambhar, avial, kalan/pulissery, olan, thoran, mezhukupuratti, pachadi, kichadi, Erissery, pappadam, pickles, chips, Pradhaman, sambaram (yogurt water), small yellow banana etc. Even though Onam is celebrated throughout Kerala with a feast, there are differences in dishes that are served depending upon the region. In the southern part, Thiruvanthapuram, from where I am, we like to serve parippu curry and Pradhaman especially Ada Pradhaman (made with thickened rice noodles) and also instead kalan we like to serve pulissery. In the middle region of Kerala, they like to serve with kurukku kalan and Palada Pradhaman, where as in northern part, Kootu curry, sambhar made with coconut and Aviyal made with yogurt, sometimes Pazham kalan (kalan made with fruits) will be in the menu. Among the pickles, Vadukapuli Naranga achar (Wild lemon pickle) is famous for onam along with pulinji( ginger pickle) and Mango pickle. Further more every part of Kerala seems to have certain rules of how dishes are served on the banana leaf. The food is first served on the extreme tip end of each banana leaves (as we call it Nakila), usually they start serving from left to right, in top part of leaves, starting with , salt, pickles, thoran, aviyal, olan,aviyal, kichadi, pachadi and Erissery. Bottom part, from left to right, is small banana, chips, pappadam and rice into the rice add, ghee, parippu curry. Once you finished parippu curry add sambhar, rasam, kalan and Pradhaman, finally sambhar or water down yogurt. A good food enthusiastic banana leaves only have some leftovers on the curry leaves after he or she finish their lunch. Over here getting an intact banana leaf with the tip is out of question, at most what I can get is parts of the leaf, so I can’t follow the way of serving that I have explained. I do have a banana plant in my yard, but it is still a baby with its small leaves. This is our Onasadhya that I made. Here goes the recipe for Ada Pradhaman. In a medium sauce pot add 2 cup of water and cook ada until it is done. It takes about 20 minutes. Once it cooked well remove from the fire and drain in colander and wash with running water and set aside. In a small sauce pan add sabudana and ¼ cup water and cook for about 12 minutes or it becomes translucent. Drain everything into a strainer and wash with running water to prevent further cooking and set aside. In thick bottomed pan heat jaggery with ½ cup water and let it melt completely. Once jaggery is melted remove and strain for impurities. Bring to boil again and add cooked ada and fry until it becomes thick. It takes about 5-7 minutes. To this add ½ cup thick coconut milk + 1 1/2 cup water and brings to boil for about 5 minutes. To this add cooked sabudana and rest of thick coconut milk. Add ginger powder and cardamom powder and switch off the flame. In a small pan heat Ghee/clarified butter and fry raisin until they plums up. Then fry cashews until they become golden color. 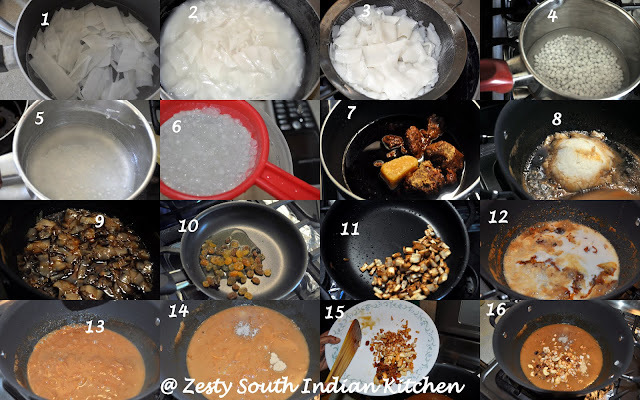 Then fry chopped coconut to golden brown color and add fried raisin, cashews and coconut pieces into cooked ada pradhaman. Enjoy the ada pradhaman as you wish. Happy Onam! !Ada Pradhaman looks perfect for the festivities. Happy Onam and Ada Pradhaman looks simply fantastic. Hi Swathi Happy Onam to you and your family…Yummy Ada Pradhamam looks delicious in that traditional vessel. Happy Onam, ada pradhaman looks so delicious, my fav in all the payasams..sadhya looks great !! Happy Onam to you too 🙂 There was just once I had a complete Onam mal in my friend’s place and it was so yum and comforting. Hope you are having fun! Esto es absolutamente delicioso me encanta muy saludable,quiero probar,abrazos. Onam Greetings and Wishes to you! Happy Onam to you and your family dear. Hope you have a great time. Happy Onam dear, looks delicious ! Onam greetings to you and your family…payasam looks super yum! Well, then Happy Onam to you dear Swathi. But 20 dishes that is a feast. I would love to be there just to taste them. Happy Onam to you!!! First time to your space and liked ur your recipe collections. Nice to meet you here and happy to follow you. Happy Onam. New recipe .. looks yummy. I like that everything was served on a banana leaf. What a lovely holiday and what a delicious dish! Happy Onam! Thank you for sharing your festival with us.